Stock status is current as of 4/19/2019 6:36 AMET. 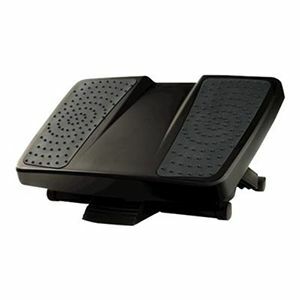 The Fellowes(R) 8067001 Ultimate Foot Support features a free-floating platform that elevates feet and legs and allows a rocking motion to help improve circulation and reduce lower back pain. Plus, surface massage bumps help relieve stress. The Fellowes(R) 8067001 Ultimate Foot Support has three platform height settings and up to 25deg tilt.